Obikes, the yellow and grey rental bicycles that suddenly appeared in the hundreds across the Sydney Metropolitan area on August 14 this year, have raised the ire of rangers acting for the Sydney Harbour Foreshore Authority. Last weekend, hundreds of the conspicuous bicycles were rounded up from the CBD and interned in a compound managed by the Sydney Harbour Foreshore Authority, now known as Property NSW. When City Hub approached Property NSW to determine if the bicycles were impounded, a spokesperson replied, “Property NSW has concerns about the growing number of unattended bicycles obstructing public areas and potentially causing safety and congestion issues for visitors. A number of abandoned dockless rental bikes have recently been removed and stored in a designated area at The Rocks. The bikes have not been impounded and, at this stage, Property NSW has not sought to recover any incurred costs. The Singapore-based oBike, which also operates in 40 cities in 11 countries, launched in Melbourne on June 15 this year, before releasing bicycles in Sydney. Up to 2000 are planned across the metropolitan area. This comes after another rental cycle company, ReddyGo, launched their rental bicycle scheme earlier this year. Up to 6,000 of ReddyGo distinctive red dockless bicycles will be in operating across Sydney by Christmas. However, it has not been a smooth ride for the machines, which are unlocked by a mobile phone app. Amsterdam, one of the most bicycle-friendly cities in the world, banned them because they don’t have docking stations and were said to take up limited parking spaces. London Council in England also impounded 100 of the bicycles within weeks of the scheme launching. Melbourne Mayor Robert Doyle is hostile to their introduction. oBike spokesperson Chethan Rangaswamy told City Hub, “We have always been open to working with local authorities for a sustainable roll out of the bike sharing program in Sydney. A ranger at the Property NSW compound in The Rocks confirmed they were gathering up the bicycles. “If we see them obstructing the footpaths we remove them for safekeeping. The owners are emailed and told where they can come and collect them. “ReddyGo have been cooperative and come and collect their bikes, but oBikes completely ignore us. There is a collection of them here now,” he said, indicating approximately 50 yellow and grey bicycles grouped opposite the Park Hyatt Hotel in The Rocks. Property NSW wouldn’t confirm whether they would start issuing fines if the bicycles continue to obstruct footpaths. This might mean oBikes will have to install docking stations across Sydney, which they’ll undoubtedly have to rent from respective councils. This will likely push up the price of the bicycle hire, currently set at $1.99 per half hour, after payment of the initial $69 deposit membership fee. 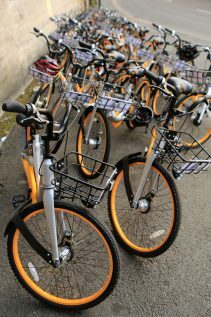 Obike responded, “oBike is in a constructive and open dialogue with the local authorities to address these issues of isolated incidents as well as enforcing strict standards of practice and operational guidelines for bike-sharing operators. “We are working on solutions for the parking problem.. The standoff between authorities and dockless rental bicycles looks set to escalate.